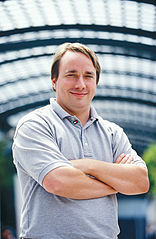 According to Wikipedia, Linus Torvalds once said "The future is open-source everything". However the original link from that page is broken. Thanks to some investigation by John Vanderberg, the original quote was placed in the page January 2005, by Stirling Newberry. One can also find the quote in several books including Matt Mason's The Pirate's Dilemma, 2008., Prasidh Mishra's Managing Electronic Resources, 2011., Steven Heller and David Womack's Becoming a Digital Designer, 2011., among many others. Even Cambridge University publishes the remark. However, try as I might I could not find an original source for the quotation. Keith Curtis, who included the quote in After the Software Wars, 2009., readily admitted to me that he "didn't bother to always find original sources for many quotes". So did Linus Torvalds actually say this or not? As he often does, albeit with a slight element of surprise for many attendees, Linus Torvalds attended Linux Conf AU. I caught up with him after the presentation Dirk Hondel on developing a subsurface diving log. As is well known, if you actually have sensible to say, Mr. Tolvards is quite approachable. So I asked him whether he made such a remark. After all, one should go a primary source whenever possible. Meeting Sir Tim Berners-Lee is a little like meeting Johannes Gutenberg in recognising an inventor who has fundamentally changed the way we engage in engage in communication and provide information. As a person who has been interested in the pragmatics, phenomenology, and political economy of such technologies for more than two decades, the lure was two strong, listening to his speeches at both ANU (for LCA) and the University of Melbourne, where he spoke on various contemporary developments especially on the legal circumstances surrounding the suicide of Aaron Swartz. To get one issue out of the way, as many have remarked, TBL is not a great public speaker. He speaks quickly, tangentially, and without a conventional narrative - not unlike his own invention. But that's a rather trivial concern for who we're dealing with here. Anything more than a passing criticising of the inventor of the world wide web for poor public speaking skills is not unlike criticising Martin Luther King Jnr, for not inventing the world wide web. It should be added that on one-to-one questions and answers that he is able to focus his knowledge exceptionally well. OpenCV (Open source Computer Vision) is a library of algorithms and code for computer vision with extensive documentation and books. Snopes.com, the "Urban Legends Reference Pages" is an excellent site for debunking said material. Email chain-letters particularly annoy me because people simply don't do any verification testing at all; a particularly bigoted and false email circulated prior to the last Australian census is one which particularly annoyed me. Although I was even more annoyed when one person showed complete indifference to the facts and continued circulating said email. Almost made me want to become an imam out of spite towards the vile bigot. Installation of OpenFOAM (and Paraview) can be carried out through several different methods, depending on the user's desires and the Linux distribution and package manager that is being used. Essentially there are three main methods; either installating with the Advanced Packaging Tool (apt) common on Debian, Ubuntu, Mint, etc., with various front-end implementations (e.g., aptitude, Synaptic, Ubuntu Software Center), the Red Hat Package Manager (rpm), common on SuSE, RHEL, Fedora, CentOS, Mageia, etc., with its front-ends (e.g., yum, up2date, urmpi), and compiling from source. The installation of the chemical simulation suite, Schrödinger on high performance computer systems is hardly unusual. What is problematic is when users wish to access the GUI package, maestro, remotely using x-windows forwarding. Except when a user is extremely close to the system it is extremely likely that the graphic representation will be frustratingly slow for manipulation. There is, however, some ways around this. JAGS (Just Another Gibbs Sampler) Installation. For those fascinated by the world of analysis of Bayesian hierarchical models using Markov Chain Monte Carlo (MCMC) simulation (and let's face it, who isn't? ), there is a delightful program called JAGS. Unfortunately it is a little stubborn to install. Download the latest version from our friends at Sourceforge and extract in a sensible place (e.g., /usr/local/src/JAGS. Now witness some example failures to install, which a reasonable person would assume would be sufficient. Read more about JAGS (Just Another Gibbs Sampler) Installation. Some R libraries and packages are easier to install than others. The typical method is to download the tarball and run R CMD INSTALL -l /path/to/library pkg1 pkg2 from the Linux command line or install.packages(c("pkg1", "pkg2")) from the R command-line after selecting from chooseCRANmirror(). But not every R package follows this contention. Can "ghoti" be pronounced "fish"? gh is pronounced "f", like "enough". o is pronounced "i", like "women". ti is pronounced "sh", like "nation". The first published reference is in 1874, citing an 1855 letter that credits ghoti to one William Ollier Jr. When establishing a website database (e.g., Drupal, Wordpress etc) with PhpMyAdmin (e.g., through CPanel) one may be surprised to discover that the default character collation order is in latin1_swedish_ci. For most "plain text" ASCII-style posts this isn't a problem. It becomes a problem however when an article is supposed to display characters which require a different character set. A personal discovery of this nature was with Esperanto diacritical characters. Characters which latin1_swedish_ci cannot display will be replaced with "? ", one per character.